Macular Degeneration (AMD) is a condition that affects the macular of your eye and results in deteriorating vision. It usually affects both eyes though can present in just the one eye. It is the leading cause of visual impairment in the UK. The macular is a small area found in the very centre of the retina (the light-sensitive tissue at the back of the inside of the eye). Whilst small in area the macula has a very large role in a person’s vision. The macular contains a very dense quantity of light-sensitive cells (cones) that allow a person to see fine detail and colour perception. 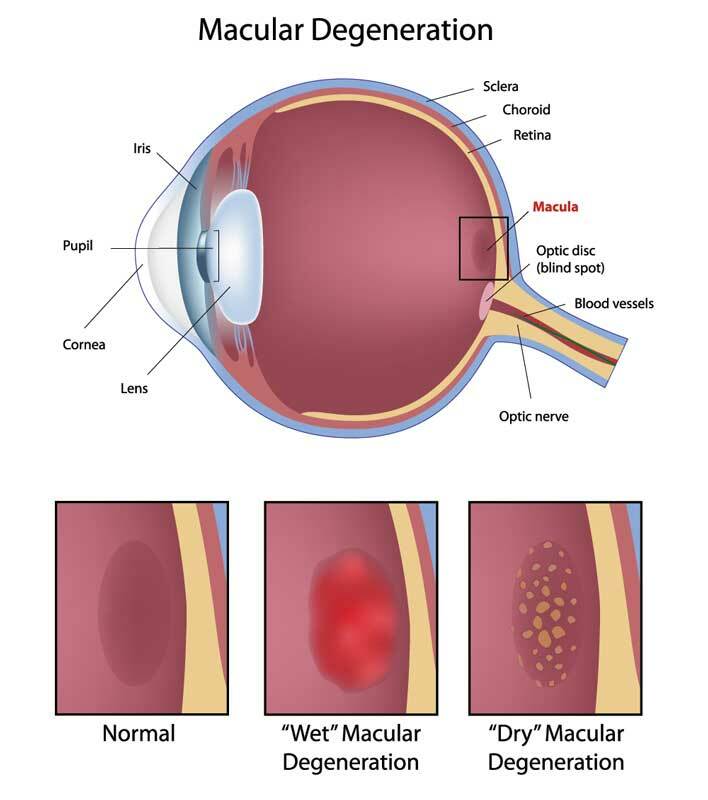 There are 2 broad classifications of macular degenerations; DRY and WET. This is by far the most common form of AMD and is often accepted as just being a normal ‘age change’ at the back of the eye. It is far more common with age and is generally slow in its progression. It occurs as the macular starts to struggle to function properly, due to a build-up of ‘waste products’ often as a result of a lack of nutrients. This is far less common than dry AMD but is often far more devastating in its presence. Wet AMD occurs as a result of new blood vessels forming underneath the macular. These blood vessels are often weak and so leak or bleed under the surface of the retina. This can reduce a person’s quality of vision significantly within days. It often manifests itself in the form of blurred/distorted vision – straight lines no longer appear straight. Other factors that are thought to contribute include; weight, sunlight, alcohol. Macular degeneration can be detected and diagnosed at a routine eye examination. At Maskell + Associates we photograph the macular with retinal imaging as part of every exam, and offer OCT scans as a supplementary test for earlier detection. There is currently no treatment known for dry AMD but it is generally thought that a healthy life-style, exercise and diet can help reduce the chances of it occurring, or postpone its onset. Additional supplements can be obtained with the aim of increasing the available nutrients at the macular and hopefully slowing down any progression of the condition, or prevent it from happening in the first place. These are often recommended to people over 50, especially with a family history of AMD. Treatment is available for wet AMD though it is unlikely to improve any damage that has already occurred, but will hopefully slow down or stop any further damage. The most common treatment for wet AMD is either laser surgery or an injection into the eye to prevent the blood vessels from leaking. If you feel that your vision is getting worse then you should always seek the advice of your doctor or optometrist. If you notice that straight lines appear wobbly then it is essential you get things checked as soon as possible, ideally that day.